Mr. Odell is a wrongful termination lawyer in Los Angeles, California. He represents terminated employees in lawsuits against corporations. 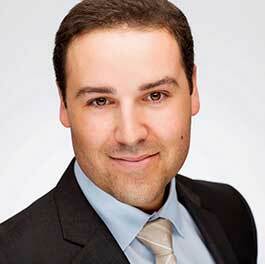 He offers free consultations to potential clients. If he takes your case he will represent you on a contingency fee. This means he does not get paid unless he successfully recovers monetary damages for you. California’s wrongful termination law is strong. It gives everyday people the ammunition they need to fight back when they are fired. No other state in America protects employees more than California. But legal ammunition is not enough. Without a competent wrongful termination lawyer CA’s strict employment laws are just fancy words on paper. You must have a fantastic employment lawyer to wield those laws and demand justice. Our team focuses all of their attention on one area of law. If you have a dispute with your former employer, you don’t want to hire a lawyer who takes every client that walks in the door – you want to hire a wrongful termination lawyer who dedicates all of his or her efforts to fighting for employees. This focus and specificity has given our attorneys an incredible track record of success. This office represents people who have been fired for a variety of reasons. The below list is a short description of each area. Click the link for more detailed information. 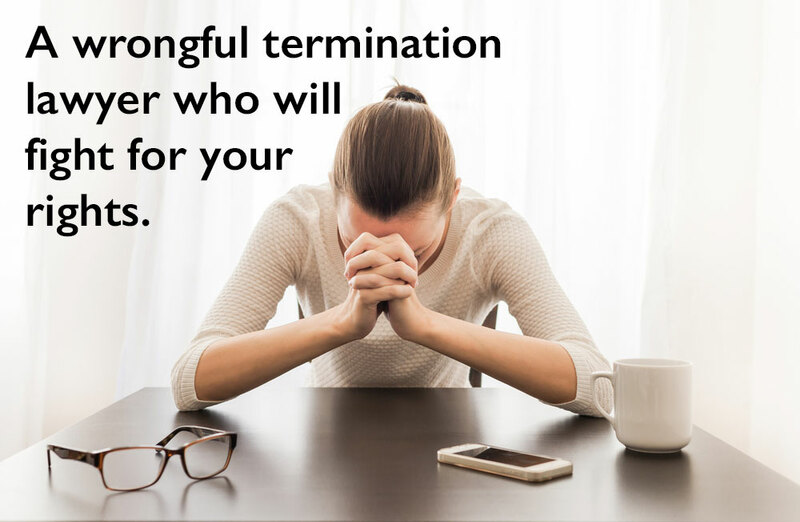 Wrongful Termination – If you’ve been fired from your job and your gut is telling you that your dismissal was illegal, you may have been wrongfully terminated. This page describes the difference between a legal termination and a wrongful termination. It also details the remedies available to employees who prevail in wrongful termination lawsuits. Finally, it explains the statute of limitations and the average value of verdicts and settlements. Discrimination – Believe it or not, but employers still sometimes discriminate against employees because of their race, religion, sexual orientation, ethnicity, age, or pregnancy. California’s main anti-discrimination law, the Fair Employment & Housing Act, protects employees far more than the Federal anti-discrimination law, Title VII. Follow the discrimination link to learn more about protected categories in the Golden State. Disability Discrimination – It is extremely common for employers to fire disabled employees. California law does not permit this if the employee can perform the essential functions of the job with or without a reasonable accommodation. This is a complicated area of law and if you wish to investigate further click to learn more. Harassment – Harassment is an unfortunate reality of life. But it doesn’t have to be at work. Employers are required to prevent co-worker harassment if they know that it is occurring. CA employers are automatically liable if a supervisor harasses an employee. Therefore, if you’ve suffered from a hostile work environment you should visit our page to see if you should pursue your case. Leave of Absence – CA’s wonderful leave of absence laws are useless if employer choose to fire employees for exercising their rights. It is important to enforce the law when this happens. Our site contains detailed information regarding FMLA, CFRA, PDL, and military leave law. Sexual Harassment – The most common type of harassment is sexual harassment. Thousands of women across California are victims of workplace harassment. If you’ve been severely harassed or terminated because you complained about harassment, read this page. Retaliation – Lots of people stand up for what is right at work. But sometimes the bosses don’t like it and take revenge. Retaliation is an area of law that protects people when an employee opposes unlawful practices at work. If you’ve been retaliated against, you should research the law deeper or call for a free consultation. Whistleblower – California has several powerful whistleblower laws. If you’ve complained to a public agency or your supervisor about illegal conduct, and then got fired, you should review our whistleblower page. The sole focus of our attorneys in an employment lawsuit is to win. We want to seek justice for the sense of betrayal and hurt feelings. Since terminated employees also suffer from significant monetary harm, we also seek to maximize your economic recovery. More often than not, it is in the best interest of the client to settle his or her case for a fair amount. We always attempt to obtain a fair settlement. But settlement does not always happen. Resolution via trial may be the only option in contentious cases. Ms. Freeze and Mr. Odell have extensive trial experience and have won several large verdicts for their clients. In the past few years, they have recovered millions of dollars for their clients. TerminationLawyers.com is a website. It is not legal advice. The information presented here is general, and should not be used by anyone without first speaking with a wrongful termination lawyer. Nothing should serve as a substitute for speaking with an experienced employment lawyer. All free consultations are over-the-phone, not in-person. TerminationLawyers.com’s lawyers do not give legal advice over the phone. If a wrongful termination lawyer believes you may have a case, we will schedule a more in-depth, in-person meeting at one of our office locations to discuss the details of your case. All cases are different and we do not guarantee any result. Any of the verdicts or settlements reported on this website are for informational purposes only and do not represent the value of all cases. Each case is different and evaluated based on the unique facts. No two cases are the same. Sometimes good cases settle for small amounts. Sometimes bad cases settle for large amounts. We make no promises. By submitting the contact form to TerminationLawyers.com (right-hand side of each page), you consent to having your contact information, including your name, phone number, and information stored and sent to the Attorney in order to allow our attorneys and staff to contact you about your potential case.